Poker Grump: OMG, I actually WON the thing!!! OMG, I actually WON the thing!!! 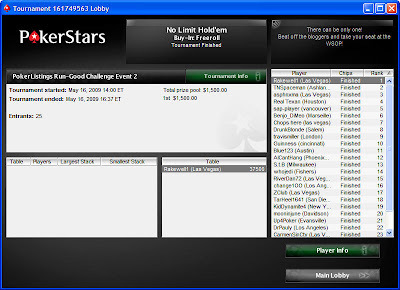 When I posted here about having been invited to the PokerListings Run Good Challenge, I exuded false bravado about actually winning myself a seat to the WSOP, which I otherwise would never attend. I did not genuinely expect to win. In fact, at the risk of giving you TMI, I fully expected to get knocked out early (as usually happens, given that I'm a pretty lousy online tournament player), so after I reluctantly crawled out of bed when the damn alarm went off, I never even got dressed. Yep--literally played the whole tournament in my underwear. Maybe I should try that strategy more often. Most of the action is recounted in the previous blog post, which I updated as the tournament was going on. But then it got too busy when it was down to three or four players left, so here's the missing action. Again, it was all in pre-flop, as would be expected with hands this big when it's that short-handed and the blinds were so huge. There's no skill in this, and nothing to brag about. I simply got lucky twice, winning both races (interestingly, one with A-Q, one beating A-Q). As everybody says, that's what it takes to win these suckers. As the name of the tournament implies, you can't do it without running good. Today was my day. And, of course, the crubs always get there. So I went into heads-up play with a whopping 8:1 chip lead. It was incredibly fitting that my opponent was TNSpaceman (Jason Kirk)--the very same guy who had put the bad beat on me very early in the tournament, and almost knocked me out when his AK beat my KK! Poetic justice! Revenge! I just had to play patiently and wait for the good opportunities. That meant letting a lot of little pots go his way to avoid doubling him up. He did chip up quite a bit, topping out at around 11,000, as I recall, but I don't think I ever had less than a 2:1 lead. What kept running through my head--especially this being a winner-takes-all event--was "Don't blow it. Don't blow it. Don't blow it. Don't blow it." Because I was playing quite conservatively, he was correctly taking advantage of my reluctance to put chips in, and showing aggression more often than I was. I used that to trap him by slow-playing it when I got lucky and flopped two pairs. Also lucky was that, as a result, he paired on the turn. And that was it! After 37 hands of heads-up play, I had all the chips. Spaceman was a worthy opponent. He did nothing wrong, but simply had too much of a chip deficit to overcome. A jack or queen or ace or king hits on the river in that last hand, he doubles up and I have a serious battle on my hands. Once again, I just got lucky in a critical spot. $1500 instantly showed up in my PokerStars account. Technically, I could withdraw it and spend it on whatever I wanted. But the organizers/sponsors politely asked the participants to use the money to actually enter one of the $1500 WSOP events. I think it would be in poor taste and bad faith to do anything else. Heck, I'll even wear their logo if they ask me to, just out of gratitude for the incredible opportunity. So, as my previous headline proclaimed, I'm goin' to the WSOP! I assume that I can choose any of the $1500 events that I want. I don't yet have any idea which one it will be. It appears that I will be doing some work at the WSOP again this year (about which more sometime soon), so I'll have to find one of the tournaments that fits in with that schedule. Talk about running good: I flopped seven sets (four of them with pocket 3s) in this tournament of 277 hands, and won every pot when I did. 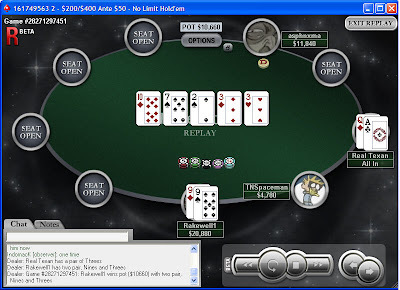 I also had pocket aces five times (only one would be statistically expected), and they were never cracked. I have to give a little shout-out to my nephew, Ben, and to Cardgrrl, because virtually all of my online heads-up experience has come from playing against them. It proved to be extremely useful experience. I think it kept me from blowing the lead by bluffing off my chips foolishly, as I believe I would have been inclined to do without that practice. See the brief official PokerListings write-up here. See F-Train's account here. See Spaceman's account here. 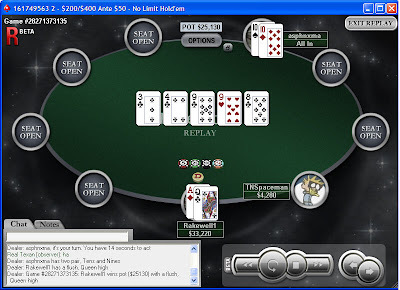 See Dr. Pauly's account here, including a hand that I missed (different table, I think), in which 2-4 took down pocket aces (as if there's anything surprising about that). See Change 1oo's account here. See Amy Calistri's account here. See DrunkBlonde's account here. See Shamus's account here. Other participants who posted extremely brief summations of their tourneys include one of the Wicked Chops Entities (oooo, almost forgot to capitalize that! ), Poker Shrink Tim Lavalli, and Iggy. Congrats, that's a pretty sweet win. Keep us updated on what event you decide to play. Well deserved and well earned. Well played, sir. Now go win that bracelet! well done, sir. Yes, you got good cards, but you also have to know what to do with them to get paid off. congrats... for the record, the "opponent" who flopped two pair (A6) vs your 66 was yours truly - Kid Dynamite: DYKWTFIA?!?!? Deuce-Four cracked pocket aces? Standard. P.S. Congrats! I hope you win the WSOP donkament and can flash the Deuce-Four of crubs next to the bracelet in the championship photo. Congrats on your win. It was a fun game! I look forward to seeing you around, like maybe at the WSOP. Decision: Which donkament to enter?